Sometime around the birth of my oldest daughter it was asked of me when I planned to get her ears pierced and where I’d consider taking her to have it done. At first I was very noncommittal and had planned to wait until she was at least 6 months old; I amused myself by searching online for the cutest pairs of diamond studs and little hoops. As time went on though I began to have second thoughts about the idea of piercing her ears simply for my own selfish pleasure. The more I thought about it the more I convinced myself that piercing someones ears without their consent was not a decision I was comfortable with. It wasn’t long before I became determined to wait until my oldest reached the age where she could decide for herself whether or not she wanted to pierce her body. My Sophia will be 5 in May and so far I’ve stuck to my decision but sometimes I do think to myself how darn cute she would look with a pair of earrings in her ears. Luckily for me I was approached by a company called EarZings who wanted to have me feature them on my blog during the holidays. My ear piercing dilema appeared to have taken care of itself all on its own the day owner Laura Pfaff contacted me about featuring her EarZings on my blog. Not only did I NOT have to pierce my daughters ears but I could enjoy the same effect (without altering her body or subjecting her to a needle gun) with none of the pain that came with clip on earrings or magnetized verions (I remember how painful those were from my own childhood days when I was allergic to piercings). It was because of EarZings that the face of pierce-free has been changed forever. Thanks to its unique coil construction the EarZings attach gently to the earlobe but with enough gradual tension to ensure that the piece stays in place. The patented design allows for unparalleled pierce-free comfort, as well as allows them to stay secure to the ear, no matter what activity your little one happens to be participating in. While working with Laura this holiday season I was able to choose two pairs of her wonderful EarZings to test out and to review here on my blog. I received the Scrumptious and Glitzy EarZings for my review! The Scrumptious EarZings are my favorite pair out of the two but I adore both of them. Even better, my daughter loves them! The adorable cupcake design is a terrific option for any little girl, whether she’s 5 or 15, and the rhinestones embedded give them just the right touch. 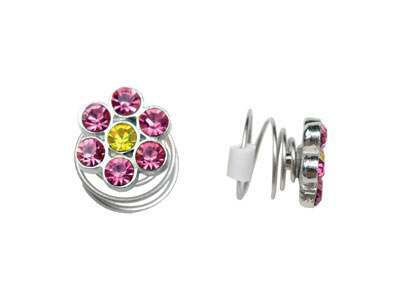 The Glitzy EarZings are another favorite of mine and like the Scrumptious design, my daughter is in love with them. She loves her “flower” EarZings. The fact that she loves them and that they’re the right size for her ears while being comfortable, is a big plus for this pair of EarZings. If you’re on the search for a gift for your little one that doesn’t involve taking them to your local piercing shop or that requires you to break the bank, then EarZings are definitely the way to go. There are so many designs to choose from, they aren’t painful like their magnetic or clip on counterparts and there’s no special care instructions like you need to follow with ordinary piercings. I’ll definitely be using EarZings again in the future! Connect with EarZings on Facebook|Twitter|Pinterest|Instagram and never miss the latest news!